The plastic pit was irregularly shaped, only a few feet down at its lowest, and with one side sloped. Tareq should have been able to climb out easily. But it was clear from the stench wafting up to Mhumhi that he had been stuck down there for several days. “Tareq, what happened?” he called down, wagging his tail. He was expecting Tareq to start crying, so when he did not- when he just looked up at him with a kind of grayness to his face- Mhumhi began to feel truly worried. “I fell down,” he rasped. He shifted his legs in the shallow puddle of filth that filled the bottom of the pit, shutting his eyes as though the motion pained him. Mhumhi saw that one was bent at a strange angle. Tareq just gazed up at him, eyes hollow. Mhumhi paced around the edge of the hole for a moment, then walked carefully down the steep slope on one side, claws scratching and skidding, to the point where he could just manage to stretch his head out to Tareq. Even as Tareq slowly reached for him he realized that the motion would be futile. He wouldn’t be able to get enough purchase moving backwards to drag him out. Tareq rested an arm over his neck, and Mhumhi licked the inside of his elbow. It was filthy. He was smeared with dirt and refuse. “Tareq,” said Mhumhi, but he had turned his head away. Tareq turned his head to look at him, and Mhumhi was struck again by his hollow look and his lack of tears. Mhumhi hesitated for a long moment, feeling as through his grip on the plastic were slipping, as though he were going to tumble headfirst into the pit. “They’re not dogs like we are,” Mhumhi said, or tried to say, and flinched when Tareq aimed a weak punch at him. “Tareq!” snapped Mhumhi, flashing his canines, and Tareq went quiet and still at once. The response, and the fear in his expression, made Mhumhi want to cringe. “Nobody wants to hurt the screamers,” he said, more softly. “You’re a liar,” mumbled Tareq. Mhumhi let it pass. Tareq’s lips parted and his brow furrowed. “Because there is nothing else to eat,” said Mhumhi. Tareq’s jaw went slack, and he made a garbled noise. “Listen-” said Mhumhi, already regretting his words, but Tareq seemed to convulse, squirming backwards, slopping in his own filth. “I’m going to!” cried Mhumhi, licking his forehead, licking his hair, nuzzling him. But Tareq was shivering. Mhumhi sat, so that his chest pressed against Tareq’s face, and pulled a paw over his shoulder, holding him close. 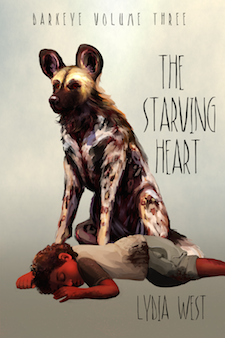 Tareq curled his fingers into Mhumhi’s fur, pressed his face there, and didn’t say anything. Eventually his breathing stopped coming so ragged. Mhumhi closed his eyes and thought of how he’d first seen him, a little sick hulker who wet himself. The first thing he’d done was reach towards him and laugh. Tareq didn’t even know that Sekayi and Mini were dead yet. Mhumhi squeezed his eyes tighter shut for a moment, then opened them and gently pulled away. Tareq’s eyes flickered, and then he rubbed them with the dirty back of his wrist. He tilted his head back, up towards the sky. “Yeah… he brought me… he brought me…” Tareq’s face twisted. “I saw the bad dog, too,” said Tareq. That got Mhumhi’s attention again. Mhumhi had to digest this for a moment, but Tareq kept talking. “She came over and looked in and I said help, but she didn’t help. She left.” He scowled. Mhumhi had almost forgotten whose marks he’d been following to get to the pit. Something like a laugh threatened to burst out of him. “She didn’t and that’s dumb,” said Tareq. Mhumhi decided to let it go for a moment. “I can use my hands,” said Tareq, wiggling his fingers. Mhumhi licked him on the cheek, then turned to make his slippery descent back up the plastic slope. He had just started rooting around in the nearby garbage when he heard Tareq’s voice, calling thinly. He loped back over to poke his head back down into the pit. “Nothing,” said Tareq, gazing up at him. “I’ll be right here,” Mhumhi reminded him, and resumed his search. It took him a little while, as the sun slowly crept downwards over the horizon, but finally he was able to locate a long piece of stiff rubber hose with ragged ends. He yanked it free from the pile of debris pinning it down with a loud crash and trotted it back over to the hole. With the hose in his mouth he couldn’t warn Tareq, so he caught the boy by surprise when he started feeding the hose down over the slope. The end brushed his shoulder, and he jumped and squirmed backwards with a little whimper. Tareq looked a little uncertain, but he complied and wrapped his fingers around the other end. Mhumhi bit down deep into the rubber, braced himself, and gave a backwards yank. Tareq’s arms jerked out but the heavy rest of him did not follow. Mhumhi took a small step back, tugging, snorting through his nose. Tareq’s body began to move, and then he let go with a cry. Surprisingly, Tareq did not complain anymore, just picked up the hose again, his dark skin taking on an unhealthy pallor. Mhumhi began to pull him again. Bit by bit Tareq came up the slope, though he kept making pained utterances as his broken leg dragged behind him. Mhumhi’s neck and teeth were already aching from the strain, but he tugged grimly, paws scraping for purchase in the shifting garbage. They were perhaps halfway up when Mhumhi noticed Tareq’s sweaty hands slipping downwards on the hose. With the end in his mouth he could not say anything, only stand there struggling to support Tareq’s weight with his teeth. Tareq, too, seemed helpless, staring at his hands as they slimed down the rubber. He was going to fall. Mhumhi was just thinking he’d have to try to ease him back down before he landed on that leg again when there suddenly came a series of loud clattering thumps and a familiar hairy form sprang in front of the pit. Vimbo extended his neck, took Tareq by the back of his ragged shirt, and deposited him on the ground beside himself. Mhumhi dropped the hose, working his jaw, tail wagging furiously. The hyena- still bearing that nasty grimace- gave a little grunt, but he was busy nosing Tareq, who was lying on his side, quite still. Mhumhi clamped down on his own inner excitement and went to Tareq’s side. It seemed like he had half-fainted, and it wasn’t hard to see why now that he had a closer look at that leg. It was horribly swollen and twisted the wrong way under the knee. This brought up an issue Mhumhi hadn’t yet considered; namely how he was supposed to move Tareq with that broken leg. It was a somewhat horrible oversight, because now he also noticed that the sun was getting somewhat low, and the screamers tended to look for food at dusk. He was not sure that they would attack Tareq, but then, he hadn’t thought they’d attack Sekayi, either. Mhumhi paced back and forth, a sinking feeling enveloping him. Vimbo watched him for a moment, then lay down. If only they had that cart again! Not that it would do well in this garbage, but at least it would give them some way to drag Tareq into somewhere sheltered… Mhumhi wanted to laugh, because perhaps pulling Tareq out of the pit hadn’t been such a great idea after all. But he wasn’t going to put him back down there in that filth. If only there was something… some way… Mhumhi gave a little whine. If he stayed here, he could protect Tareq. But then Hlolwa and the puppies would be alone. He looked down at Vimbo, who was still lying there, looking up at him. As soon as their eyes met, the hyena rolled his shoulder against Tareq’s side. “Oh!” said Mhumhi, nearly springing into the air. “Oh, Vimbo, that’s-” He shook himself. Vimbo couldn’t understand him, and Mhumhi had no idea if he meant what he thought he did; but then again, they had tried to do it before with Mini. Mhumhi went over and tugged on Tareq’s arm, so that it flopped over Vimbo’s back. It seemed the hyena really had had the same idea, because he held very still, only his ears shifting back and forth. Mhumhi went around the other side of him and did his best to gently drag Tareq the rest of the way over. Tareq groaned, his eyelids fluttering, but he seemed mostly inarticulate due to the pain. The leg on Mhumhi’s side was the injured one, and Mhumhi cringed a little, but he wanted Tareq to be draped over Vimbo so his head wouldn’t be bumping on the ground. He gingerly took the little ankle in his mouth and, figuring it’d be best to get it over with, gave a ferocious tug. Tareq howled, and the leg wobbled unpleasantly in Mhumhi’s grip, things sliding where they shouldn’t, and Vimbo jerked his head back in surprise. Mhumhi let go, as Tareq shuddered and whimpered. But at least he was securely flopped over the hyena on both sides, and his leg looked like it was aligned in a slightly better way. Vimbo gave Mhumhi a measured look and got up, moving quite deliberately. Mhumhi caught hold of Tareq’s hand to stop him from sliding backwards- he’d forgotten how sloped the hyena’s back was. Vimbo ducked his head down. “Can you hold onto his neck, Tareq?” Mhumhi asked, but Tareq seemed to far gone to respond. Vimbo gave a little whine-giggle. They began walking together. Mhumhi was leading- roughly- but he’d have to stop often and readjust Tareq, who frequently slid one way or another. Vimbo bore it with patience. Tareq certainly weighed less then him, but his long hulker limbs still dragged on the ground sometimes. And even if Tareq weighed less, it was still a considerable burden for the hyena to bear. Thinking this, Mhumhi stopped and licked the side of his muzzle, where his teeth were permanently bared. Vimbo responded by yawning, his short tail flicking from side to side. He was feeling such goodwill towards the hyena and hyenas in general at that point that it didn’t occur to him that he’d forgotten another large issue until they reached the stacks of tires and Vimbo stepped carefully down into the dirt. He heard Hlolwa’s hoo-bark coming from a short distance away, then another, sharper, warning bark. Mhumhi had led Vimbo, Imbwa’s killer, right to her den, right to her pups, and she was coming over fast.